نظری بجگان, علیرضا, اکبرزاده, آرش, صالحی, حسن, کامرانی, احسان, یاسمی, مهران. (1396). صید بر واحد تلاش صیادی فانوس ماهی (1890 Benthosema pterotum, Alcock) در تور ترال میان آبی در آب های شمال غرب دریای عمان. فصلنامه محیط زیست جانوری, 9(4), 263-268. علیرضا نظری بجگان; آرش اکبرزاده; حسن صالحی; احسان کامرانی; مهران یاسمی. "صید بر واحد تلاش صیادی فانوس ماهی (1890 Benthosema pterotum, Alcock) در تور ترال میان آبی در آب های شمال غرب دریای عمان". 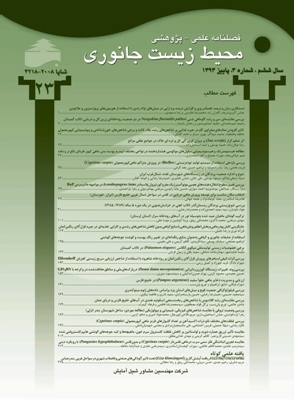 فصلنامه محیط زیست جانوری, 9, 4, 1396, 263-268. نظری بجگان, علیرضا, اکبرزاده, آرش, صالحی, حسن, کامرانی, احسان, یاسمی, مهران. (1396). 'صید بر واحد تلاش صیادی فانوس ماهی (1890 Benthosema pterotum, Alcock) در تور ترال میان آبی در آب های شمال غرب دریای عمان', فصلنامه محیط زیست جانوری, 9(4), pp. 263-268. نظری بجگان, علیرضا, اکبرزاده, آرش, صالحی, حسن, کامرانی, احسان, یاسمی, مهران. صید بر واحد تلاش صیادی فانوس ماهی (1890 Benthosema pterotum, Alcock) در تور ترال میان آبی در آب های شمال غرب دریای عمان. فصلنامه محیط زیست جانوری, 1396; 9(4): 263-268. فانوس ماهیان یکی از ذخایر مهم و ارزشمند آبزیان در آب­های دریای عمان می ­باشند. در این بررسی، میزان صید و صید بر واحد تلاش صیادی (CPUE) فانوس ماهی گونه Benthosema pterotum در آب­ های شمال ­غربی دریای عمان (صیدگاه جاسک) مورد بررسی قرار گرفت. نمونه ­برداری در دو فصل بهار و تابستان 1395 با استفاده شناور ترالر پرشین تایگر مجهز به تور ترال میان آبی انجام گرفت. در مجموع 69295 کیلوگرم فانوس ماهی در طول دوره نمونه ­برداری و 141 عملیات ترال ­کشی شد. حداقل و حداکثر مقدار صید بر واحد تلاش در هر نوبت تورکشی ترال به ­ترتیب 13/33 و 1000 کیلوگرم بر ساعت به ­دست آمد. در فصل بهار بیش ­ترین میزان صید بر واحد تلاش در هر نوبت ترال­کشی 1000 کیلوگرم بر ساعت و در فصل تابستان 33/333 کیلوگرم بر ساعت به­دست آمد. میانگین صید بر واحد تلاش (± خطای استاندارد) فانوس ماهی در فصل بهار و تابستان به ­ترتیب 24/91±241/27 و 7/03±88/57 کیلوگرم بر ساعت به ­دست آمد، که تفاوت معنی­ داری را نشان داد (0/05>P). میانگین صید بر واحد تلاش (± خطای استاندارد) در لایه­ های عمقی 220-200، 240-220 و 260-240 متر به ­ترتیب 25/47±171/96، 23/62±167/67 و 24/07±151/35 کیلوگرم بر ساعت به ­دست آمد که با افزایش عمق این میزان کاهش یافت، ولی اختلاف معنی­ داری را بین این اعماق نشان نداد (0/05<P). نتایج این تحقیق می ­تواند در بحث مدیریت صید و نحوه بهره­ برداری از ذخایر ارزشمند فانوس ماهیان در آب­ های دریای عمان مورد استفاده قرار گیرد. کیاالوندی، س.، 1390. تعیین صید به­ ازای واحد تلاش (CPUE) و ترکیب صید ضمنی در تور­های ترال میان آبی فانوس ماهیان در منطقه جاسک. پایان ­نامه کارشناسی ­ارشد شیلات. دانشکده شیلات و محیط زیست، دانشگاه علوم کشاورزی و منابع طبیعی گرگان. 76 صفحه. ولی­ نسب، ت. و حسینی ­شکرابی، س.پ.، 1390. الگوی رشد و تعیین سن روزانه فانوس ماهی Benthosema pterotum در دریای عمان. مجله علمی شیلات ایران. سال 20، شماره 1، صفحات 147 تا 160. FAO., 2001. Trilateral workshop on lanternfish in the Gulf of Oman. FAO Publishing. Rome, Italy. 22 P.
Figueroa, D.E. ; Diaz de Astarloa, J.M. and Martos, P., 1998. Mesopelagic fish distribution in the southwest Atlantic in relation to water masses. Journal of Deep-Sea Research. Vol. 45, pp: 317-332. Gartner, J.V.Jr., 1993. Patterns of reproduction in the dominant lanternfish species of the eastern Gulf of Mexico. With a review of reproduction among tropical, subtropical Myctophidae. Bulletin Marine Scie. Vol. 52, pp: 721-750. Gulland, J.A.,1983. Fish stock assessment: A manual of basic methods. Wiley. New York, USA. 236 P.
Haddon, M., 2011. Modelling and quantitative methods in fisheries. Chapman and Hall/CRC. Florida, USA. 465 P.
Hosseini-Shekarabi, S.P. ; Valinassab, T.; Bystydzienska, Z. and Linkowski, T., 2015. Age and growth of Benthosema pterotum (Alcock, 1890) (Myctophidae) in the Oman Sea. Journal of Applied Ichthyology. Vol. 31, pp: 51-56. Ishihara, S. and Kubota, T., 1997. Food habits of the lantern fish Benthosema pterotum in the east China sea and the yellow sea. Nippon Suisan Gakkaishi. Vol. 63, pp: 522-530. Johannesson, K. and Valinassab, T., 1994. Survey of mesopelagic fish resources within the Iranian exclusive zone of the Oman Sea. FAO Final Report. Rome, Italy. 81 P.
Karuppasamy, P.K. ; George, S. and Menon, N.G., 2008. Length-weight relationship of Benthosema pterotum in the deep scattering layer of the eastern Arabian Sea. Indian Journal of Fisheries. Vol. 55, pp: 301-303. King, M., 2007. Fisheries biology, assessment and management. Wiley-Blackwell Publishing. New Jersey, United States. 400 P.
Kinzer, J.; Bottger Schnack, R. and Schulze, K., 1993. Aspect of horizontal distribution and diet of myctophidae fish in the Arabian Sea with reference to the deep water oxygen deficiency. J of Deep Sea Research. Vol. 40, pp: 783-800. Linkowski, T.B., 1996. Lunar rhythms of vertical migrations coded in otolith microstructure of North Atlantic lantern fishes, genus Hygophum (Myctophidae). Marine Biology. Vol. 124, pp: 495-508. Nafpaktitis, B.G., 1982. Myctophidae. In Fischer, W. and Bianchi, G. FAO species identification sheets for fishery purposes. 3 rd Ed. FAO publication. Rome, Italy. pp: 1-8. Nelson, J.S., 2006. Fishes of the world, 4 th Ed. John Wiley and Sons, Inc. New York, United States. 622 P.
Paxton, J.R. and Eschmeyer, W.N., 1995. Encyclopedia of Fishes. Academic Press. Massachusetts, United States. 240 P.
Poulsen, B.; Holm, P. and Mackenzie, B.R., 2007. A long term (1667-1860) perspective on impacts of fishing and environmental variability on fisheries for herring, eel, and whitefish in the Limfjord, Denmark. Fisheries Research. Vol. 87, pp: 181-195. Reynolds, R.M., 1993. Physical oceanography of the Gulf, Strait of Hormuz, and the Gulf of Oman: results from the Mitchell Expedition. Marine Poll Bull. Vol. 27, pp: 35-60. Rodriguez Grana, L. and Castro, L.R., 2003. Ichthyoplankton distribution off the Peninsula de Mejillones, Chile (23 S, 71 W), under variable hydrographic conditions during the austral summer and winter of the 1997 El Nino. Hydrobiologia. Vol. 501, pp: 59-73. Rojas, P.M.; Escribano, R. and Marin, V.H., 2002. Fish larvae distribution off Mejillones Peninsula (northern Chile) during a coastal upwelling event in spring 1999: interactions with the cold upwelling plume. Fisheries Oceanography. Vol. 11, pp: 233-244. Valinassab, T.; Pierce, G.J. and Johannesson, K., 2007. Lanternfish (Benthosema pterotum) resources as a target for commercial exploitation in the Oman Sea. Journal of Applied Ichthyology. Vol. 23, pp: 573-577. Wang, J.T. and Chen, C., 2001. A review of lantern fishes and their distributions around Taiwan and the Tungsha Island with notes on seventeen new records. Zoological Studies. Vol. 40, pp: 103-126.